The Washington Department of Health plans to test several hundred water systems in the state for trace contamination of more than a dozen chemicals found in some firefighting foams. The chemicals are called per- and polyfluoroalkyl substances or PFAS. They already have been found in five Washington drinking-water systems at levels over the Environmental Protection Agency (EPA) guidelines, as well as dozens of private drinking-water wells near firefighting training areas where the foams were used. Department officials will use the test results to help assess the scope of the problem as they work with the Washington State Board of Health to develop possible state standards for some of the chemicals. Polyfluoroalkyl and perfluoroalkyl substances are man-made compounds, manufactured since the mid-20th century, and resistant to heat, water and oil. Uses of PFAS have largely been phased out in the United States. They are in fire retardants, such as firefighting foam at airfields. Also used in paint, carpets, the manufacture of nonstick cookware, food- takeout containers, clothing resistant to soil, stains and water. There is debate about health effects, but some studies link the substances to an increased risk of cancer, higher cholesterol, suppressed immune systems and problems in fetal development. The highest levels have been detected in watersheds near military bases, industrial sites and wastewater-treatment plants, where these chemicals were commonly used. Humans’ most common exposure is through food and dust, with only about 20 percent coming through drinking water. A survey indicates PFAS are in the blood of 98 percent of the U.S. population. The federal review was conducted by the Agency for Toxic Substances and Disease Registry, a federal public-health agency, and recommends “minimal risk levels” for four PFAS chemicals in drinking water. This level, for at least one of these chemicals, is considerably more stringent than the EPA guideline, according to the January email. Now, more than three months after the email was circulated, the draft report has not been made public. This has raised bipartisan concerns in Congress that the Trump administration is trying to delay publication or alter the findings. In a statement released to The Seattle Times, a spokesperson for the Agency for Toxic Substances and Disease Registry said no date has been set to release the draft study for public comment. The statement said the document has been through a “normal review process” that has led to “a number or revisions. It also said the agency is working with other federal partners to provide “consistent and proper interpretation” of the minimum-risk levels, which are intended to assist state and federal agencies in setting regulatory standards. In Washington state, the federal review is of keen interest to state officials, and they want to find out what it has to say. “Absolutely, I would like to see what a federal agency would think after a thorough assessment, ” said Barbara Morrissey, a Washington health-department toxicologist who will head to D.C. this week to attend a two-day “National Leadership” summit the EPA is hosting on chemicals. The state PFAS testing is financed by a $150,000 EPA grant, and it is expected to get underway in the months ahead. The Department of Health initially proposed 312 water systems considered to have a potential for contamination, such as those near sites where firefighting foams have been deployed. The testing can be a sensitive issue, stoking concern when the results are released. So far 18 operators of water systems have turned down the state request to conduct tests, according to Liz Coleman, of the state Department of Health. The per- and polyfluoroalkyl substances began to be produced in the mid-20th century, and there are more than 3,000 different compounds. In addition to firefighting foams, they are used in many other products such as food wrappers and carpets, and can be detected in the blood of 98 percent of the U.S. population. Some studies have found they can increase the risks of cancer, higher cholesterol, suppressed immune systems and problems in fetal development. But scientists and policymakers are grappling with what constitutes safe levels for these chemicals when they show up in drinking water. The email, obtained by the Union of Concerned Scientists, and first reported by Politico, indicates that the unpublished study recommends a level as low as 12 parts per trillion for at least one PFAS chemical. That is far more restrictive than the current EPA guideline level of 70 parts per trillion set for two of the PFAS chemicals. This email was part of a chain of messages released to the Union of Concerned Scientists. The correspondence indicates the draft report also drew the attention of the Defense Department, which has found more than 120 sites where firefighting foam used around military airstrips appears to have contaminated sources of drinking water. The Defense Department has paid for alternate sources of water and other assistance when the contamination levels reach or exceed the EPA 70 parts per trillion guidelines. So a much-lower threshold could increase the number of water systems and private wells that would need assistance from the military. The unpublished study also was scrutinized by EPA staffers, some questioning some of the methodology used by the Agency for Toxic Substances and Disease Registry. Another EPA official suggested an interagency review of the study. The most blunt language was used by an unidentified White House staffer, whose email was cut and pasted into a second email written by James Herz of the Office of Management and Budget and forwarded to EPA officials. The emails became public May 14 when Politico published reporter Annie Snider’s story. They drew a quick response in Congress. Sen Patty Murray, D-Washington, and 10 other senators sent a letter to Trump administration officials requesting the study be released, and Rep. Cathy McMorris Rodgers, R-Spokane, joined 12 other House members in making the same demand of EPA administrator Scott Pruitt. In McMorris Rodgers’ district, the Defense Department conducted tests last year around Fairchild Air Force Base. 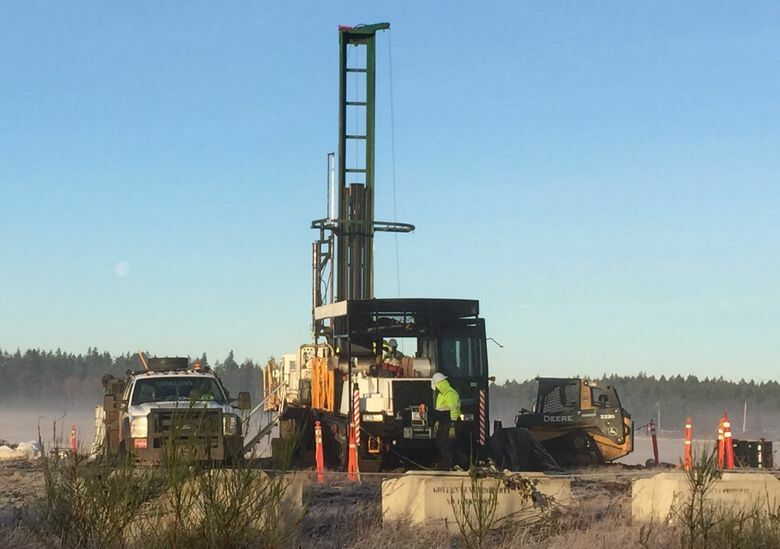 The results indicated that 81 private wells have PFAS contamination above the EPA guidelines, as does the water system for Airway Heights, a community of more than 6,600 that, since the contamination was detected, has secured water from Spokane. The PFAS drinking-water contamination found in Washington in July prompted a coalition of groups led by Toxic-Free Future to petition the state health department to develop a drinking-water standard. The groups requested that standard be set lower than the EPA guideline. State health officials say the process to develop a Washington PFAS plan will extend until 2019. Still uncertain — just how many chemicals will be covered by the plan.